There has been much said, done and written about the terror of "Berserk Male Syndrome" or "Aberrant Behavior Syndrome" in llama circles. Yet no clear definition of either "syndrome", which should be a collection of symptoms, seems to exist in veterinary texts or llama care books. This would understandably be confusing to the person new to llamas, the veterinarian new to llamas, and even intimidating to experienced llama owners. Perhaps we should not be so concerned with the fact that llamas do indeed sometimes exhibit dangerous behaviors, but more amazed by the fact that there is only one documented case of a human being being killed, albeit indirectly, by a llama. People are killed by horses every year, and by dogs several times a year. Hand raised male deer are listed as "dangerous animals" in wildlife rehabilitation texts and human deaths are not unheard of from these animals. So, in light of the previous, I would like to try and offer descriptions of several syndromes, as described by the observable behaviors, appropriate actions that owners might consider and veterinarians might recommend. I hope only that these syndromes might be helpful to all involved with llamas, perhaps spare human injuries, and perhaps save the lives of some animals who are mistakenly thought to be "incurably berserk". 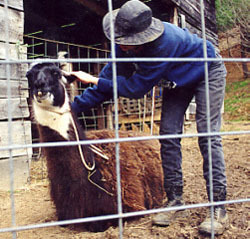 This llama is usually an "over-handled" llama who is intact (an un-gelded male), has often been bred, and has received no training or intervention. 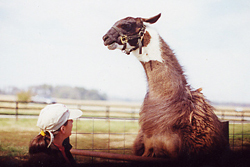 However, in our experience, we have seen llamas who had no prior history become aggressive later in life without obvious provocation except for management changes.